Or, get it for 74000 Kobo Super Points! 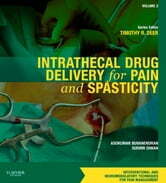 Intrathecal Drug Delivery for Pain and Spasticity - a volume in the new Interventional and Neuromodulatory Techniques for Pain Management series - presents state-of-the-art guidance on the full range of intrathecal drug delivery techniques performed today. Asokumar Buvanendran, MD and Sudhir Diwan, MD, offer expert advice on a variety of procedures to treat chronic non-malignant pain, cancer pain, and spasticity. Comprehensive, evidence-based coverage on selecting and performing these techniques - as well as weighing relative risks and complications - helps you ensure optimum outcomes. Understand the rationale and scientific evidence behind intrathecal drug delivery techniques and master their execution. Apply the newest techniques in intrathecal pump placement, cancer pain management, use of baclofen pumps, and compounding drugs.